The building is easily accessed by public transport and has a range of accessible facilities including hearing loops, wheelchair access and support animals allowed. 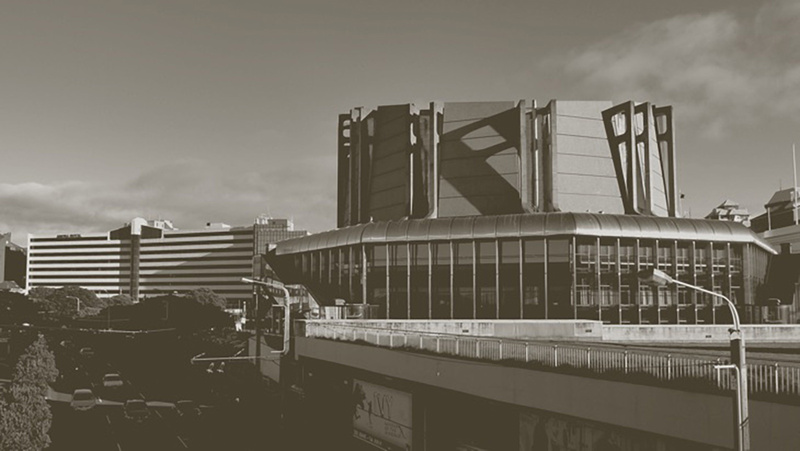 An accessibility report of the Michael Fowler Centre can be found here. Additionally, there will be a quiet area available, to provide a calm space away from the hustle-bustle of the main conference area. As we respect everyone’s right to use a bathroom facility that best fits their gender, there will be mens and womens toilets as well as an all-gender facility, indicated by a sign. If there is anything in addition to the above that you need or would like, to help make your Webstock experience a more accessible, inclusive and just all-round better one, please don’t hesitate to get in touch. We’ll do all we can. Within the venue are a number of artworks created by colourist Gordon Crook. It is his work that has served as the inspiration for our new visual identity. Between 1981 and 1983, Crook produced twelve spectacular banners for the Michael Fowler Centre and also made ten panels, seven metres by seven metres, for the outer wall of the auditorium. The theme for both was ‘Definitely Wellington’. We honour Gordon Crook’s work and his contribution to the venue, to our fair city, and to the art world as a whole.